Moab Westwater Combination Trip - Biking & Colorado River | 2 in 1! 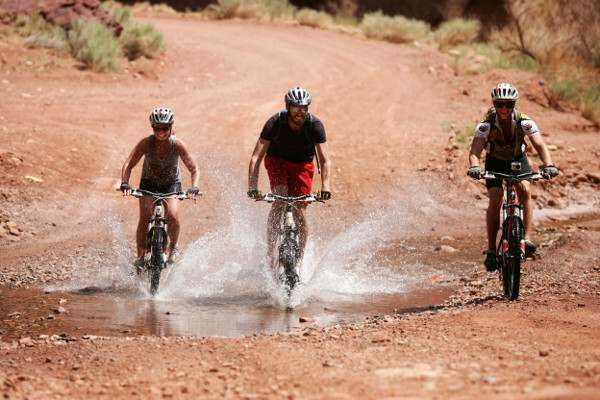 The Moab mountain biking–Westwater Canyon combination trip brings together two of the most popular activities in Utah. Mountain biking and Moab are nearly synonymous; the former uranium boom town has become a mecca for bikers wanting to swoop, soar, climb, and roll over the region’s sinuous sandstone and wild desert trails. Our Moab Sampler trip lets you get a taste of it all, while allowing your group the flexibility to tailor each day’s ride to your interests and skill level. Our guides will lead you on single or double track adventures through a red rock wonderland. 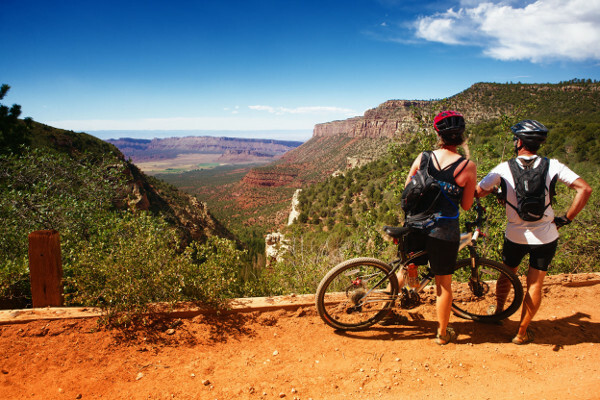 Whether it’s smelling the lupine & sage in the beatific hillsides of the La Sal Mountains, splashing through streams in Onion Creek, slaloming downhill past the Gemini Bridges or pedaling between dinosaur footprints at Klondike Bluffs, you’re sure to find the ride that leaves you just the right amount of breathless. 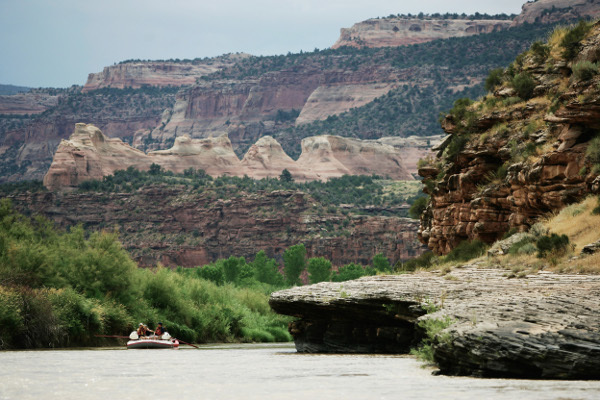 Follow this up with two days of floating on the Colorado River, splashing through rapids beneath the sheer black walls of Westwater Canyon, falling asleep to the sound of water on rocks: relaxation well deserved. 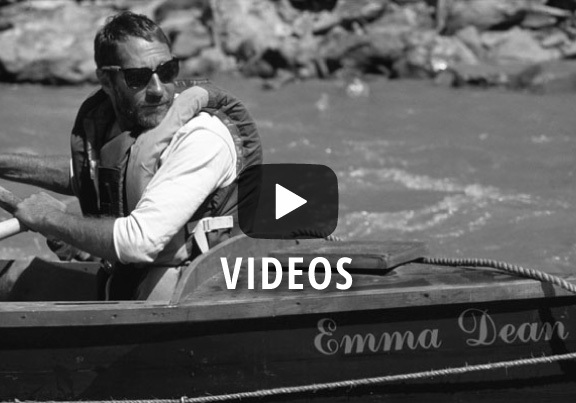 Feel the rush of Westwaters finest rapids! This sampler trip will take you to a medley of red rock trails around the greater Moab area. On your third day, our vans will pick you up for a quick ride to a remote ranger station, the entrance to Westwater Canyon. Finish your trip in the legendary ghost town of Cisco, Utah. This is one of our most customizable trips; our itinerary can vary widely from one trip to the next. The following is just one example of the variety of itineraries we can create based on the group's interests and ability levels, weather, and campsite availability. Day 1: Meet group at headquarters in Green River, Utah at 7:00 a.m., Mountain Time, where we will issue your waterproof bags. You can buy any last minute items from our accessories store at this time (see our packing checklist for a list of items you can find at our store). Before leaving our headquarters, each guest along with a Holiday River Expedition guide will perform a pre-trip inspection of your bikes. If you are providing your own bike, please make sure that it is in good repair. We recommend a complete service by a professional shop prior to the trip. Guests with bikes that fail our inspection will be asked to rent a Holiday bike for $170.00/person. A one-hour van ride to Moab marks the start of the trip. We will select a base camp on public land outside of town, location to be determined by where we want to ride, weather, and camp availability. We'll start with a warm-up ride: the Bar M trail network north of Moab provides a number of excellent short beginner and intermediate single-track loops. Options for after lunch include riding the Klondike Bluffs or Magnificent 7 trail networks. Klondike Bluffs features intermediate, undulating trails; more difficult trails climb up ledgy rocks and over expanses of slickrock. Magnificent 7 provides options for longer technical downhill rides, as well as lengthy scenic loops, including side trips to the spectacular Gemini natural bridges. Dinner and solar showers await back at base camp. Day 2: Today's ride can be as leisurely or as ambitious as the group wants. With the whole day ahead, advanced or expert groups could choose to tackle the Amasa Back trails. The new Navajo Rocks loop is a longer intermediate option that climbs gradually and descends via a long, flowy trail with short technical sections (remember: it's always okay to walk sections you don't feel comfortable with!). You can also return to Magnificent 7 or Klondike to try the trails we missed the day before. Our guides are always out exploring new trails and can suggest the best options for each group. Night two's camp could be the same as night one's, in a location more convenient to the day's ride, or even at one of the developed campsites along the Colorado River. Day 3: Drive to the put-in for Westwater Canyon on the Colorado River. Look for bald eagles on the cliffs above the river as you adjust to having the water work for you! 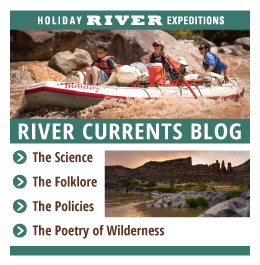 Swim through some mellow whitewater, visit an old gold-miner's cabin, and pull up to camp on a cozy beach within the black schist of the inner canyon. Day 4: Enjoy a leisurely breakfast (omelets, anyone?) before we dive into the whitewater: one big drop after another, including Skull Rapid, the narrowest part of the entire river: only 35 feet across! Watch the canyon walls fall away as we approach the take-out, where our vans await to bring us back to our headquarters in Green River, typically around 4:00 p.m.
Keep in mind that this is only a sample itinerary. Your own trip's itinerary will be built as your group goes. We invite you to arrive with an open mind, a flexible attitude, and an appetite for adventure! ***The Bicycling: The Moab Sampler mountain bike trip does not have a fixed itinerary, but is designed to provide access to the best of Moab's bike trails. These trails may consist of packed dirt with gentle up and down sections; loose rocks and gravel; sand; ruts; winding or steep turns; technical ascents and descents, including ledges, exposure, or slickrock; steep uphill and downhill sections. Guides will select trails based on groups' interests and riding ability, but a good level of fitness will make the riding more enjoyable. Riders who have no previous off-road bicycling experience should be experienced road cyclists with good athletic ability. All riders should prepare for the trip by riding their bike on a regular basis prior to the trip. Karen was always very helpful and willing to answer any questions asked. Very patient, as we each took time to complete the required paperwork. Was very nice to have clean sleeping bags! Guides (Dustin, Sam, Chris and Nick) were knowledgeable, very skillful, helpful, patient and great with all types of people and requests. We were all very impressed with their ability to engage well with all guests, while navigating all aspects of our bike ride and river trip to ensure we all had fun and felt safe. Dustin is an excellent leader, who is professional, talented, articulate, aware, and we appreciated his hospitality. And all are great cooks. Thanks for a very enjoyable time! Group of friends and individual arrangements. Dave and Josh were top shape and experienced. Dave pretty much took point on many issues and balanced the over ambitious types with the under performers to insure all had a good time. Nice techniques to never say no while re-directing those who had ideas that weren't in line with the company policy or good practice. Josh is a great guy and also did a very nice job serving pretty much every need. Great effort by both. Dave and Josh are outstanding in everything that they do. They are knowledgeable, skilled, friendly and a great face for your company. Off the charts A-1, first class fun experience. Would repeat in a heartbeat.